Intel 520 Series SSD Pictured - Possible Not SandForce Driven? 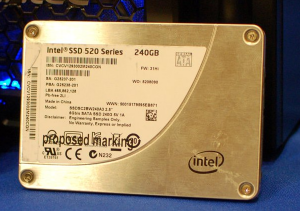 The SSD Review has more info about the new Intel 520 series SSD, you can check it out over here. Could we be wrong? It has been a long standing belief by The SSD Review that the new Intel 520 Series SSD is 'SandForce Driven' however new evidence has come to light that brings forth another worthy candidate. Anobit Technologies have recently received a great deal of funding from Intel Capital and, as it just so happens, markets their own controller with remarkably similar specs. Check out the pick of the Intel 520 as well!! !